These DIY wedding decorations are a fun and easy craft to do with your bridal party, or even your fiancé! Making your own place cards is a cinch with the help of this how-to guide. Give your big day a personalized touch when you create these fun, and minimalistic place cards. 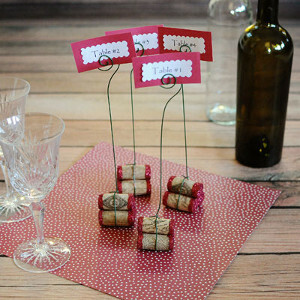 Help your guests find their seat in a cute, creative way. You won't regret the money you save, or the fun time that this tutorial will provide! Glue three corks together with Aleene’s® Tacky Glue, holding in place with rubber band until set. Cut wire to 18” long. Wrap one end of wire around corks and twist together with wire cutters. Curve the other end of wire into a spiral. Squeeze glue onto ends of corks and while wet, sprinkle with glitter until covered. Cut 1 1/2 x 3” rectangles from red scrapbook paper. Print out table numbers on white paper, cut out and glue to red paper. Insert cards in spirals to complete.